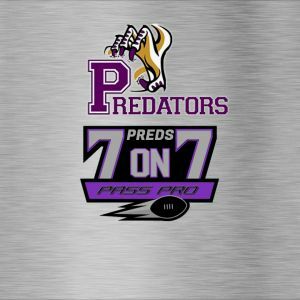 WHY SHOULD YOU PLAY Predators 7V7? IMPROVE SKILLS: The best way to improve route running, catching the football, timing, and more is through repetition, and 7on7 provides the opportunity to improve those skills in a safe, non-contact environment. TEAM CHEMISTRY: 7v7 allows you to hone your skills, timing and get on the same page with your team mates in a fun and exciting way that can carry over to the regular season. CONDITIONING: Faster paced games with passing plays every down means routes are run back to back. What better way to work on your speed and agility, arm strength, explosiveness and reaction time in the off season. And did we mention it's FUN! We will be following the official CFL rules for 7v7 Passing Showvase. Football improves analytical ability by forcing players to understand strategy and spatial arrangements. Certain patterns work best for certain player rosters. Newbies typically begin in football by executing plays called by the coach. If they play long enough however, athletes begin to understand why a play is called and why one player might replace another for particular plays. In 7v7 the players can make the play calls! This provides an opportunity to learn how to read the field, read the play and execute!